Please click map for a larger view, printable PDF of the Dexter Community School District. The school district in which each address resides is listed on your property tax statements. If you are renting and aren't sure which district your address is in, you can start your search on the MapWashtenaw Washtenaw County website. After clicking on this link, you will need to agree to the site's disclaimer. After that, a page will open and you can search for your specific address. Clicking on the property address where it shows up on the map will bring up further information including school district. If your Washtenaw county address is in a township, you will be directed to the township's administrative website. You can contact their office to check the status of your address. If your address is not in Washtenaw County, your local tax authority can verify your school district for you. Please contact our office if you need further assistance determining which district you reside in. 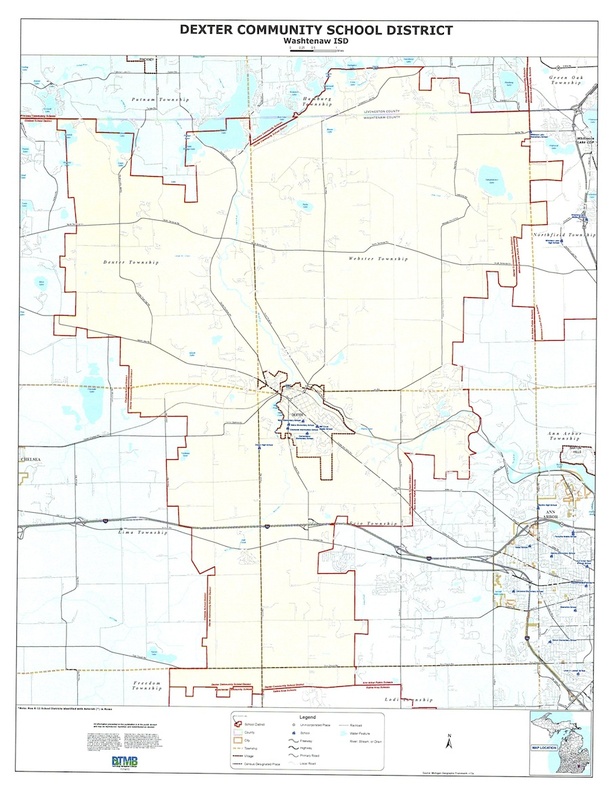 Washtenaw County School Districts map (this will help you know where else to look if your address is on a border or if you are interested in School of Choice).